program and it had been several years since Evansville High School students had played the sport. to learn the game. 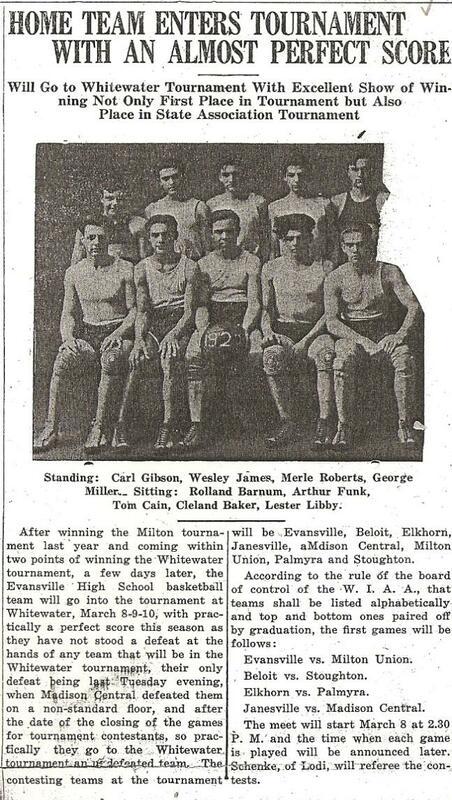 The team included Rolland "Barney" Barnum, Tom Cain, Lester Libby, Cleland "Kink"
encouragement Evansville would become a winning team. played in white T-shirts and dark blue shorts. They wore knee guards and ankle-high tennis shoes. Tom Cain, who had a sprained ankle and Rolland Barnum who was on a trip in the West. changed his pattern and began training his team for offense against the new defense strategy. gives the squad all the scrimmage it needs," Edwards told a reporter. among Southern Wisconsin schools--clever, consistent and clean." take more than 200 fans to Oregon for a game. Milton Union High School in the state rankings. When Edwards brought his team home from the Milton tournament, the team had beaten three teams. Waddell and Paul Edwards represented the faculty. his senior year. He also participated on the track team in the shot put and pole vault events. kept the local fans informed about Barnum's athletic achievements. the frosh certainly made a clown of the varsity linesmen opposite him the other night." Edwards had taught Barnum and his teammates. co-captain of the basketball team in his senior year at the University. When Barnum graduated in 1927, he helped coach the University basketball teams for a short time. Then he became one of the original members of the Oshkosh All Stars, a professional basketball team. Barnum also played semi-professional baseball as a member of the Madison Blues. Lynch, Pierce, Fenner and Smith, Inc. However, he also gave much of his free time to sports activities. For 32 years, Barnum was a Big Ten official and referee for football and basketball games. Barnum stopped refereeing basketball games in 1945, but was a Big Ten football official until 1958. Rose Bowl game in 1952 and the 1948 College All-Star game. keep up with them every year and I don't want it ever to become a chore," Barnum said. 1965. Barnum was the 10th person to be appointed to that exclusive club. School had produced a sports star and life-long champion of athletic activities. hospital. A. M. Barnum, this city, visited them Sunday afternoon. MADISON/ PEORIA, ARIZ. - Alice O'Neill Dean, age 99, died Tuesday, Sept. 20, 2005, in Peoria, Ariz.
admitted it was a smart turn. Alice and Joe moved back to Madison as Dr. Joe joined his father, Dr.
Ariz., and a resident of Freedom Plaza in Peoria, Ariz. Alice is survived by her three sons, Joseph C.